Don "Brickman" Foster talks About Proven Masonry Staining Solutions on the Michael King show. Masonry Cosmetics's own Don "Brickman" Foster is featured on Home Talk radio with "The Cajun Contractor" Michael King to discuss masonry staining solutions. You can find the link to the program at https://www.facebook.com/MasonryCosmetics/. 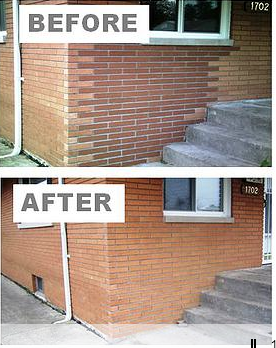 Vice President Don Foster makes a clear case for staining brick. He also notes that not all masonry-staining companies are the same. Michael King interviewed Don Foster about Masonry Cosmetics unique process. On the show, Don Foster unveils to the nation how the process differs from the competition and is not a paint or paint like stain. It is permanent, tested and natural looking. The Masonry Cosmetics products will not peel, crack, fade or blister and does not seal masonry. Don Foster stated, "We have jobs that are more than 20 years old that still look great today." The radio program aired Saturday February 13, 2016 at 11:00 am Eastern Standard Time on the Lifestyle Talk Radio Network. Masonry Cosmetics is the number one US manufacturer and distributor of do-it-yourself kits and is a full service masonry staining company providing services throughout the United States.